Jenny Mbaye is interested in urban popular cultures, and has researched on the music economy in relation to entrepreneurship, development and social transformation in Francophone West Africa. Her work generally focuses on cultural labour and creative production processes, as well as the work and policy practices of urban creativity in African contexts. Before joining City University (Department of Music, Culture and Creative Industries; School of Arts and Social Science), Jenny was a Postdoctoral Research Fellow at the African Centre for Cities (ACC) of the University of Cape Town (UCT). 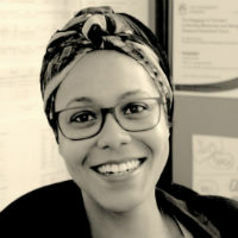 She has worked in cultural and media organisations in Senegal and Burkina Faso, and as an academic researcher in Canada, the U.K. and South Africa. She is a research and policy consultant (UNDP/UNESCO Creative Economy Report 2013, Praia Declaration, Foundations Lettera27, Fitzcarraldo). Jenny has a PhD in Human Geography, specialised in urban cultural economy (LSE, 2011), a Graduate Diploma in Management of Cultural Organisations (HEC-Montreal, 2006), an MSc in International Studies specialised in Ethnomusicology (University of Montreal, 2005), and a BA in Sociology (Concordia University, 2003).